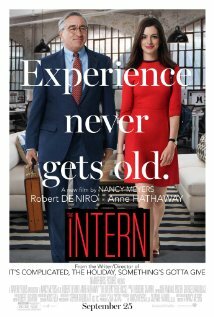 Warner Brothers Pictures releases The Intern on September 25th, 2015. NYC MOVIE GURU: Nancy and Anne, do you think that it's lonely at the top for women? Nancy Meyers: You know, I never would’ve thought of that. When you said it, I thought, that’s interesting. I don’t know about you, Annie. It didn’t strike me as any kind of loneliness as much as–I can only write what I know, so I can imagine any man who would also have this company would need Ben. I don’t necessarily think it’s because she’s female. I think when you’re taking on a big thing like that, it’s you. You’re a one-man or one-woman band, so I didn’t see it as lonely. I don’t know if you felt that, playing it. Anne Hathaway: I’m so relieved to hear you say that, because I’m like, I don’t know how to answer that, that never occurred to me, am I bad actor? Did I not ask the right questions? I thought it was not because of a gender issue, but just because I think Jules is a private person, and I think that she’s so dedicated to her company, and she dreads the idea that anything in her personal life could impact her ability to do her job and keep the company going. She doesn’t really have anyone to confide in. And then she meets Ben and their friendship develops organically, and she winds up opening up to him and taking his advice because she really, really respects him and it’s really sound, excellent advice. And like I said, that’s not forced, it happens organically, so I just thought she was more isolated, what Nancy said, because of her position. One of the things I love about the movie is you know, Jules has so much heart and she builds an incredible structure and they have bones, but there’s no connective tissue in it, and nobody at the company knows how to build connective tissue, and that’s when Ben comes in, and he kind of figures out how to get everybody to connect to each other. And I just love that observation, that in this day and age, where we have the tools for communication at our disposal, we’re using them in such a way that sometimes isn’t taking full advantage of them, or maybe that’s taking full advantage of them, but that’s not as effective as just having a one-on-one conversation. So I thought it was a great. Nancy made observations about how old school meets the new world, and each is made better because of the other. NYC MOVIE GURU: You’re such a great mentor to Anne’s character in this movie. Was there any mentor in your life who really made an impact? And second thing, are you as technically-challenged with computers as Ben is? Robert De Niro: I’m a little as technically-challenged, but I’m not far behind. No, I never had a mentor like that. I don’t envy, but I do think that’s a great thing if you are lucky enough, especially if you are in a certain untenable situation, and you have a mentor who’ll change your life. They can do that. I mentored myself, in a lot of ways. I think it’s a great thing, you know. And I like to give advice to younger people if they ask me. I have at times asked people who were further on in their careers, like Kazan or certain actors who were a generation ahead of me. I asked them what to look out for, blah blah, because I wanted to take a shortcut in some things. I don’t want to have to experience something if I don’t want to, if it’s going to be a negative one. I would just get some words of advice. So I do that with people if they ask me. I don’t volunteer it, but I’m certainly there if somebody I have some young friends who sometimes ask me stuff and I give it to them, my opinion of what the situation is. NYC MOVIE GURU: Robert De Niro and Anne Hathaway, can you speak about collaborating with Nancy and share what you admire about her? RDN: I’m used to doing movies that took as much time as our movie did. I’m from that generation, I don’t know, it just stopped at a certain point, except certain types of big-type science fiction or those types of movies, but Nancy was very specific, you know, as far as telling–we do things in a lot of takes at times, but for good reason. She was very specific about what she wanted, and I totally get that and understand it. It was terrific. These days, movies are done–don’t have the luxury of extremely long schedules or big budgets, unless you kind of just find yourself there, because you’re in it and you have to finish it, and it’s going to take longer than everybody hoped it would. AH: So, you look at Nancy and you see this tiny, adorable woman with awesome hair, and at least at first glance, I had no idea the tenacious, uncompromising, inexhaustible powerhouse that she is. I’m so lucky that i got to work with her on this, in terms of collaboration–-it’s true, though. I admire you so much. I had admired you, and even now that I’ve made a movie with you, it’s beyond. When we started, we saw the character in two different ways, and I wanted her to be wearing her stress more on her sleeve, and Nancy wanted Jules to kind of have it little bit more together. I kind of had this moment where I was like, okay, we see it different ways, am I going to feel so uncomfortable the entire time if I’m not following my instincts? And then I just thought to myself, idiot, who knows a Nancy Meyers character better than Nancy Meyers? These characters are beloved, they’re beloved by you, trust her! So, it became this wonderful exercise in being guided through a character, which is very new for me. I felt like it was a true collaboration, and Nancy is the funniest person I’ve ever met, I think she’s probably the smartest person in any room she’s ever been in, and I imagine having been a woman in this industry for the last 30 years, it’s not easy being the smartest, funniest person in the room, and being a woman, but she’s handled it with tremendous grace. And I think she’s underrated. NYC MOVIE GURU: How much would you say that you enhanced each other’s lives and changed each other’s lives as characters? How would you say this speaks to different audiences, in terms of your characters? The young audience and the older audience. RDN: I mean, she learns from him, even though he’s older and all that, and we tend to sort of not disregard, but when people are getting older, they’re kind of sidelined, in a way. The point is that he’s someone very important, if you stop and look and listen, he has advice that only somebody who’d been on the planet a lot longer can give. It’s really that simple, so she gets that from me, and my character, I get certain things from her. I wish I had said it more eloquently, but I guess that’s it. NYC MOVIE GURU: How much would you say that you enhanced each other’s lives and changed each other’s lives as characters? How would you say this speaks to different audiences, in terms of your characters--both older and younger audiences? AH: So there’s a joke that unfortunately got cut from the movie, but it’s my favorite joke in the movie– [Laughs] So it’s a scene where a character’s over at Ben’s house, and they’re talking, and he puts his beer on the coffee table, and Ben looks down and he goes, “Why would you put your beer next to the coaster?” I just feel like my generation laughs because we’re really bad about using coasters, and Boomers laugh because it’s a legit question. So that’s like, an example. I think so many of the jokes work both ways. They’re so satisfying. So in terms of what Jules gets from Ben, you know, it took me a long time to kind of crack Jules, because I kept looking for her deep, dark secret, and it turns out she’s just a really wonderful person on the inside, that’s actually the secret, her strength, that’s what makes her a good boss, is that she’s a deeply decent and nice person. And the reason the story is being told about her in this moment is she’s in a moment of unbelievable stress. And she had everything she needs to navigate this moment, except space and a compassionate ear. And that’s what Ben brings into her life, is a tremendous amount of compassion. And I don’t know if it’s generational thing or what, but I mean, I feel like there’s a lot of judgement in the world, particularly when people are in a more visible position, like Jules would be, as the CEO of a startup, where her business has grown so quickly. There’s a lot of judgement for people who are in those kinds of positions, and Ben doesn’t judge her, he just observes her and opens her, and gives her a safe space, full of compassionate understanding. And she thrives in it. And actually, he does that to a lot of people around him. And they all thrive as a result of it. And it’s a simple thing, but it’s not something we see very often in our world. And it’s something that I think if we could see more of or perhaps contribute to, we’d see a lot of really positive results. NYC MOVIE GURU: Robert, if you were to sit down with your character and got to know him, what questions would you like to know about him? RDN: I would just ask him a lot of questions about their everyday habits, what they think about things, just on and on. That’s what I would do. NYC MOVIE GURU: Anne, what advice would you give your character to make her happier? AH: Oh, god. We’re the same age, I don’t know that I have any authority to give her advice, necessarily. Honestly, like, by the end of the movie, I’m on her side. In the beginning, you would tell her make more time for [herself], but by the end, Jules really is doing the best she can, by the end of it, and I think she’s being authentic to herself and her feelings, I don’t think she’s a dramatic person who craves confrontation, and she’s honoring that aspect of herself. By the end, I think she’s treated herself and everyone around her with respect. Oh, I know what advice I would give her. Value your assistant more. But, Ben gives her that advice so she doesn’t need to hear it from me. NYC MOVIE GURU: What, if anything, did each of you learn about yourself making this film, in the process? RDN: I don’t know if I learned anything about myself that I didn’t know already. I had a very good time doing the film. You know, it was just a really terrific experience. AH: I can’t explain why it happened for me on this movie, if it was my character or the dynamic or just being around Bob’s zen or what, but … I’ve made a lot of my movies from a place of insecurity and neuroses and self-doubt, and I just got really tired of it and decided to make one from a more positive place, and to feel good about what I was doing and embrace the unknown and not necessarily assume that if I didn’t have a clear idea of how things just went, that it necessarily meant that it was bad. I could actually trust that the unknown could be good. So, I actually had a wonderful time making this movie, and I think it yielded a more relaxed performance, and I’m really proud of the work we all did out there, and what we created. And it turns out that you can make a movie without having like, nonstop sleepless nights.